The first shot was taken with Sandy's 1Ds III along with a 300mm lens. The path to the Cliff Dwellings is approximately 1/2 mile and we were only in the very first part of the path. The second shot was taken with Don's Mamiya 645 AFD II and Phase One P30+ using his Mamiya 300mm lens. This shot was taken within yards of Sandy's. 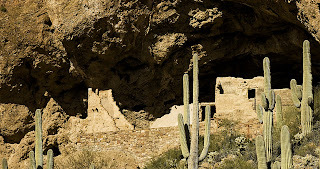 We figure this is enough of the Lower Tonto Cliff Dwellings. 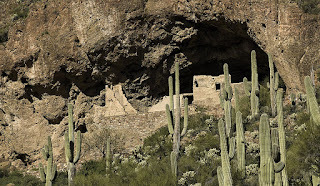 If you're in the Tucson or Phoenix area and want to see and experience cliff dwellings we highly recommend the drive to Roosevelt Lake and Tonto National Monument. We're off to the Gila Cliff House in New Mexico next month then on to Alaska in May.